The current scientific hypothesis holds that our Moon was born of a calamitous giant impact. Shortly after the planets in our solar system formed, 4.5 billion years ago, Earth was a very different place, glowing red with rivers and seas of lava. The debris of formation still littered the solar system. For millions of years, Earth and another small planetary body orbited the Sun in the same region of our solar system. The small planetary body's orbit crossed Earth's path and they collided, shattering the impactor. Its remains were blown into space or incorporated into the Earth. The core of the colliding object combined with the Earth’s dense core. Over a short time — perhaps a hundred years or less — the ring of vapor, dust, and molten rock clumped (accreted). The largest clumps attracted more and more particles, growing larger faster and faster to form our Moon. Just after its birth, the Moon was 15 times closer to Earth and Earth's day was only six hours long! 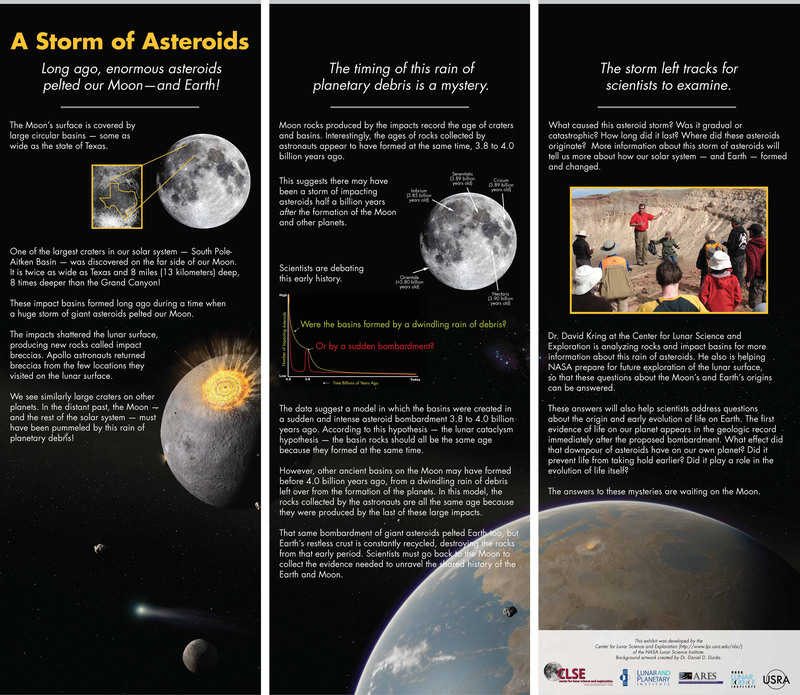 Further details about the Moon’s evolution are available on the poster “How Our Moon Formed”. Credit: Lunar and Planetary Institute. The Moon's characteristics are best explained by the current leading scientific model of the Moon's origin — the Giant Impact hypothesis. The Earth-Moon pair has an unusually large amount of rotational energy, which is combined in both the Moon's orbit around the Earth and Earth's spin. The Moon's orbit and Earth's spin are consistent with the Giant Impact hypothesis — the impact added rotational energy to the Earth-Moon system. The Moon has a much smaller core than our Earth. This, too, is consistent with the model; the impact stripped part of the outer layers of the impacting object and Earth to form the Moon. The core of the colliding object combined with the Earth’s own dense core. The Moon was formed with much less iron and other heavy elements to form its core. Lunar rock samples and meteorites contain the chemistry of the Moon and support the Giant Impact hypothesis. The searing heat of the impact drove away most of the gases and liquids, leaving a relatively dry world. Moon rocks have very little of the water and gases found in Earth's rocks. The Giant Impact hypothesis is the leading framework for explaining the current scientific evidence, but there are many unanswered details. The NASA Solar System Exploration Research Virtual Institute team at the Southwest Research Institute is using powerful computer models and information about the chemistry of early Earth and Moon rocks to help determine how the Moon formed and evolved into the Moon we see today. Infancy: Differentiation — Like all terrestrial planetary bodies, the Moon underwent a process of differentiation early in its history. Its bulk settled into layers: the heavier iron sank, forming a small core. The Moon's oldest rocks likely formed in an ocean of liquid rock — a magma ocean. When the Moon formed, it was enveloped by a deep ocean of molten rock. Young Moon: Big Impacts Form Big Basins —For the first 600 million years of its existence, large asteroids and comets continued to strike the Moon and the planets in our solar system — including Earth. These impacts are recorded as the largest gouges on the Moon, including the large circles that were later filled in with darker rock. By about 3.8 billion years ago, much of the debris in the solar system had been swept away, and impact strikes were smaller and less frequent. high rings of mountains, visible as prominent circular structures on the Moon. Credit: NASA. The details of this rain of planetary debris are a mystery. Lunar scientists are investigating whether this intense bombardment occurred in several waves, one massive storm, or spread out over a long period of time. Teenage Angst: Lunar Volcanism – While cool on the outside, portions of the Moon's interior were still hot. Pockets of hot mantle material slowly rose to the surface, melting at lower pressures, then flowing onto the lunar surface through cracks in the lunar surface. The magma flooded across the lowest regions to fill the impact basins. It cooled quickly, forming basalt, a dark volcanic rock. The large, smooth, dark regions we see on the Moon are the basaltic "lunar maria." They have fewer craters than the lunar highlands, indicating they are younger. Mare basalts have been radiometrically dated to be between 3.0 and 3.8 billion years old. Adulthood: Ongoing Impacts and Human Exploration — For the last one billion years, our Moon has been geologically inactive except for occasional meteoroid impact. The data returned by orbiting spacecraft such as the Lunar Reconnaissance Orbiter, and the Apollo program reveal much about the formation and evolution of our Moon and, in turn, of our own Earth. Erosion and plate tectonics on Earth have obscured our planet's early geological history. The Moon holds the best-preserved record of our solar system's early history and the processes of formation, differentiation, and bombardment which shaped all terrestrial planets. New missions are helping scientists to piece together details of the history and evolution of the Moon, and of our Earth). The presentations on this page are those made by NASA scientists and are intended to provide background information for program providers. These external resources are not necessarily 508 compliant. Presented on February 25, 2015. This file contains embedded videos. Download the file and click on the triangle and movie popcorn icons on slides 5, 6, 7, 9, 11, and 12 to play the videos.